World No. 1 Nadal brushed past Italy’s Fabio Fognini to join Djokovic, Federer and Murray in last eight. 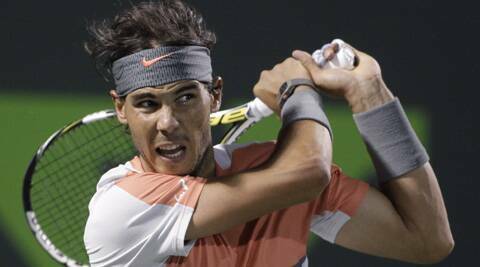 Unruffled by a bomb scare that locked down the Sony Open late on Tuesday, world number one Rafa Nadal brushed past Italy’s Fabio Fognini 6-2 6-2 to join Novak Djokovic, Roger Federer and Andy Murray in the last eight. The Spaniard showed no signs of being alarmed by the bomb scare as he completed the win in 62 minutes. “Every day I have to try to find my rhythm, try to think about myself, what I have to do well, so I just try to be focused on what I really need to do to play well,” said Nadal. “Then the opponent is free to do whatever. Tonight was not an easy match for him, for the conditions that I told you before. So it was a little bit strange, but in general, I think I was very focused and solid with my serve,” h e added. Defending champion Murray, playing his first event since splitting with coach Ivan Lendl last week, has looked increasingly comfortable and confident on his own. He disposed of 11th-seeded Frenchman Jo-Wilfried Tsonga 6-4 6-1 without facing a single break point. Djokovic, a three-time winner on the Miami hardcourts, had only two break points the entire match but that was all the second seeded Serb needed, converting both chances on his way to a 6-3 7-5 win over Spaniard Tommy Robredo. Not everything at Crandon Park tennis center went according to script, however, as Japan’s Kei Nishikori and Ukraine’s Alexandr Dolgopolov pulled off a pair of fourth-round upsets. Dolgopolov battled to a 6-4 3-6 6-1 win over Swiss third seed and Australian Open champion Stanislas Wawrinka, while Nishikori shocked fourth seeded Spaniard David Ferrer 7-6(7) 2-6 7-6(9). In other fourth-round action, big-hitting Canadian Raonic blasted German lucky loser Becker 6-3 6-4, while another big-hitter, towering American John Isner, was beaten 6-3 7-5 by Czech seventh seed Tomas Berdych. While the day got off to a gloomy start with early morning showers delaying play by 30 minutes, tennis fans were treated to a lineup of sparkling action with nine of the world’s top 10 men battling for spots in the quarters. Djokovic, riding the momentum from his Masters Series win in Indian Wells nine days ago, was first through to the last eight and was soon followed by Murray, setting up rematch of last year’s Wimbledon final won by the Briton. It was just the second match of the tournament for Djokovic, who received an opening-round bye and advanced to the last 16 on a walkover when Florian Mayer withdrew with a groin injury. Murray, fighting for form after undergoing off-season back surgery and going solo after ending his successful partnership with Lendl, finally seemed to put some of the distractions behind him, although he requested pain relief tablets for his back during the first set.